Got a few issues since RC2. 1) This is likely two different issues. b) This popup is always hidden and the only way I can get to it is via task manager and then switch to it. I can't just move the Sequencer window to uncover it because the the SEQ window is stubborn and it just 'bongs' with every click until I switch to the popup in task manager. 2) This next one is also a little weird but maybe a little related. 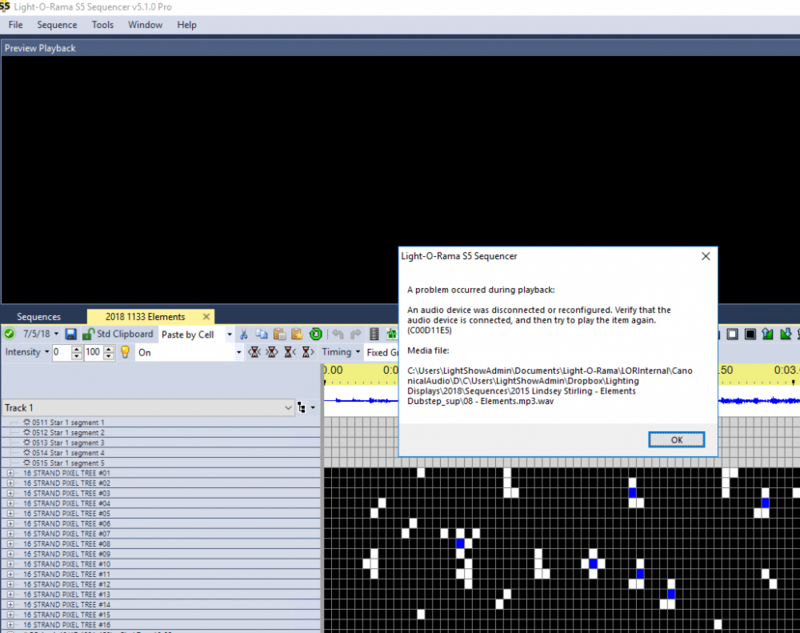 I keep finding that I sequencer won't let me click stuff (no hidden popup) and I have to go to task manager and completely kill all LOR tasks (including LOR TRAY). I can then restart sequencer and it all starts working again as though nothing was ever wrong. Error message C00D11E5: An audio device was disconnected or reconfigured. Verify that the audio device is connected, and then try to play the item again. 1) future version will include the full description of the error, not just the error code. 2) The error message should be displayed in front. Actually what happens is Windows won't display fonts at certain small sizes, but it depends on your display. So if the prop names disappear, then just move vertical zoom up or down a step. Understood - but I think it need to change to a cross hair or something "planned" the empty field made me spend hours believing that I was running into a corrupt file. Agreed. I have put that on the list for a future release. Thanks for the feedback! Matt - I am still having that popup issue with the 5.1.0 where the popup is hidden behind the active window. It also still continues to to have a very strange file/folder structure (see screen shot https://www.dropbox.com/s/23r42h4h7cf7m9j/20180802Issue.png?dl=0), there appears to be a bit of duplication which I tried to highlight with the red/blue. The strange file name happens because you are using an MP3 file. S5 converts the MP3 to a WAV file behind the scenes and uses the WAV file while you are sequencing. What you are seeing is the location of the WAV file. Something is causing the audio device in Parallels to disconnect. Not an error I have seen before. Ok, my feedback here are s that the mp3 to wav thing could be transparent. The file name is really confusing and not something a user needs to see IMHO.